I’ve been riding Diego now for a couple of months. We started out with a lot of groundwork over the winter (driving, lungeing, clicker, Lyons, TTeam, and Parelli exercises, etc.). And of course the big, bad trailer loading issue was the first thing we tackled. Although his issues were pretty well entrenched, and his anxiety was very real (like a human with claustrophobia), he came around surprisingly quickly. He now loads reliably on the first try. No more refusing, swinging, rearing, or bolting off. He seems calm and happy when he is on the trailer as well. So that was a big success. When I started riding him back in late February, he was remarkably steady and quiet. Given that my left elbow was freshly out of a cast (after surgery to reconstruct the shattered joint), I was very careful not to ask much of him or put him under any stress. We started out in the round pen, just walking and asking for nice soft halts, one-rein stops, walk-trot transitions, sidepassing, circles, and the beginning of neck reining (so I don’t have to use the left arm too much). My theory has been that if Diego can practice good behaviour long enough, and have enough successes, he might overwrite some of his own bad habits. Since I’d never ridden him through any of his antics, nor have I seen the worst of them, I have been sort of feeling my way along to find out what his hot buttons might be. I definitely wanted to avoid any explosions, since I am physically not as capable of dealing with that sort of thing with only one good arm. He’s been known to buck on occasion, though never yet with me. The peak (or depths perhaps?) of his behaviour problems happened last summer when he spooked badly and dropped his rider (and owner at the time). She suffered a very seriously broken leg. After that, and my own riding accident on Dressy, I’m being vastly cautious with him. We’ve been doing many walking trail rides, and careful, repetitive exercises. I’ve seen a considerable improvement in his confidence level as a result, and he has been a pleasure to ride for the most part. Soft-mouthed, willing, and calm. He went to Aprilfest and Queen’s Bush Training Ride, and was absolutely stellar. Very reliable on trail, and easy to ride. The start at Cayuse Canter curves through a big open hayfield in a swooping ‘S’. Halfway around you have to go down into a gully and back up, curving back towards camp, then away again. It just seems to set all of the horses off into high anxiety. Diego was desperately trying to stay right with Ares (who is Mr. Anxiety even at the best of times), with horses swirling around nearby, and horses visible well ahead and behind us too (not to mention the donkey and the alpacas). Diego did nothing too terrible, but there was an awful lot of dancing, head tossing, and bouncing around. Then a friend rode up behind us on her somewhat high-energy Arab. She was planning on riding with us, but it became apparent very quickly that another horse in the mix was not going to work for Ares. Sue, who was riding him, used extremely good judgement and got off to lead him. 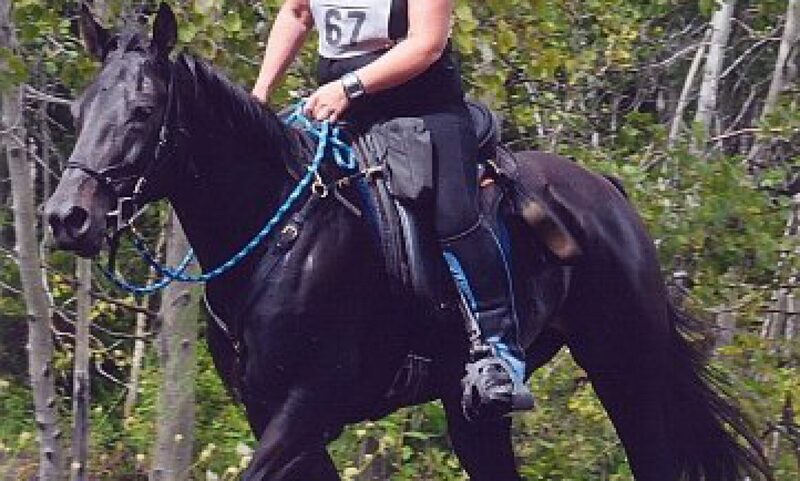 We sent Tracey on ahead with her mare. That gave Ares (and Diego too) a chance to settle down somewhat. Emily on Duke, and Andrea and her big Belgian X mare, Skye were with us too, and the four horses walked for a couple of miles until my two found their brains and relaxed (the other two were, of course, perfectly behaved throughout). By this time Diego looked like he was wearing lipstick because he was trying to keep his nose in contact with Ares’ hip and had rubbed the red grease marked entry number all over his muzzle. Sue was giving Ares a gaiting lesson, which was both good for Ares’ brain and kind of fascinating to watch. Like most Standardbreds, he is very prone to gait, and if you ride them correctly they will develop a variety of smooth gaits. I don’t know what it was she had him doing… but some sort of amble or running walk. I think he started out a little alarmed at having a stranger on his back. But Sue was really good with him, and he worked hard to please her. He’s a good boy, but not uncomplicated, and still quite green. We started to trot about 2-3 miles into the loop. Diego was still a little ramped up and we tried switching positions a little on trail. Diego still gets anxious when he’s out in front, and at one point when I asked him to take a left turn to a smaller trail he refused and reared. I drove him forward strongly (being somewhat outraged that he would rear) and for the rest of the loop he was much more settled and steady. That probably would have been the end of any shenanigans from Diego if Ares hadn’t been pulled at the mid-check. Ares’ heart rate would not come down, and when Ana noticed the little flicker in his flanks, I realized that he was likely getting ready to thump. That’s caused by an electrolyte imbalance, so we shoved a few extra doses of electrolytes into him and he came around. But we pulled him out of the ride anyway. He’d only done seven miles at a very moderate pace, and he ought to have been fitter than Diego. But it was a bit warmer than the horses were used to and obviously he’s another of those dark non-Arabs that need more electrolytes. Diego was down to 48 within a minute or two, with almost no sponging. He’s one of those Arabs who just loves the heat. It doesn’t seem to bother him at all. He really seems fitter than I have any right to expect, given how slow we’ve been going. Anyway, at the end of the check, Diego had to leave Ares. Sigh. It wasn’t too pretty going around that big hayfield again. And this time, on the way up the far side of the gully he reared again. And this time it made me even madder. I got after him and he abruptly came down and subsided totally. “Yikes! Sorry…” From that point on he was a different horse. Very polite and traveled smoothly down the trail. Emily and Andrea, who, bless their hearts, stuck with us for the second loop too, must have been tremendously relieved to have the real Diego back. The upshot of all of this is that Diego is herdbound. He wasted an awful lot of energy trying to stay in touch (literally) with Ares. I didn’t enjoy the foolishness on the first loop. But none of it was catastrophic. And he definitely does respond reasonably when I insist on decent behaviour. It gives me a focus anyway, now that I have a better sense of what is likely to cause him anxiety. I am now thinking through some strategies to teach him confidence alone (or more correctly… confidence with just me). The first step is that I’m going to separate him from the herd for part of the day. My round pen is just about knee deep in grass. It’s maybe 100 feet from the nearest paddock. So he can go out there every morning for breakfast and stay for a few hours. We’ll see how that goes. I have some ideas for groundwork and riding exercises too, but I haven’t been riding much since we got back, since my elbow has not been handling the load well at work and I’m quite sore at the moment. I’ve just picked up a brace for it, so we’ll see if that helps. Riding doesn’t generally bother it, but cleaning stalls is tough. It’s not that strong and the joint seems a bit unstable when I lift anything. Unfortunately, I suspect that Ares is not a good trail partner for Diego. Two anxious horses together definitely does not result in comfort for either of them. Though perhaps when both of them are a bit more confident, it might work better.